In episode 13 of The Melancholy of Haruhi Suzumiya (the 2nd day of Endless Eight), about 15 minutes in, after listening to Mikuru's speech filled with "classified information", Kyon asks if the classified information is something that can't be said on TV. What does it mean? What can't be said on TV? Was this an in-joke based on a difference between the anime and the written material? Rather than an in-joke, I saw this more as Kyon making a connection to the common phenomenon of television networks censor bleeping out inappropriate words, most commonly with that 1000 Hz tone sound. Television programs can also use euphemisms to censor content—for example, in the Breaking Bad episode of Mythbusters, they used "special sauce" to refer to a key chemical ingredient that they didn't want audience members knowing. I guess Kyon observed that the way Asahina uses "classified information" is similar to how TV networks censor certain things. I should mention that Asahina at least tried to explain. To the accompaniment of intermittent sobs. "Sniff, um...I normally use <classified information> to contact the future...sniff. But after a week without <classified information>, I was starting to wonder if something was wrong. And then <classified information>... I was so surprised that I tried to <classified information> in a rush, but there wasn't any <classified information>...sob. Hic. What do I do...?" I have no idea what you should do, but does that <classified information> work like some kind of censor? You've gotta watch what you say on television, eh... 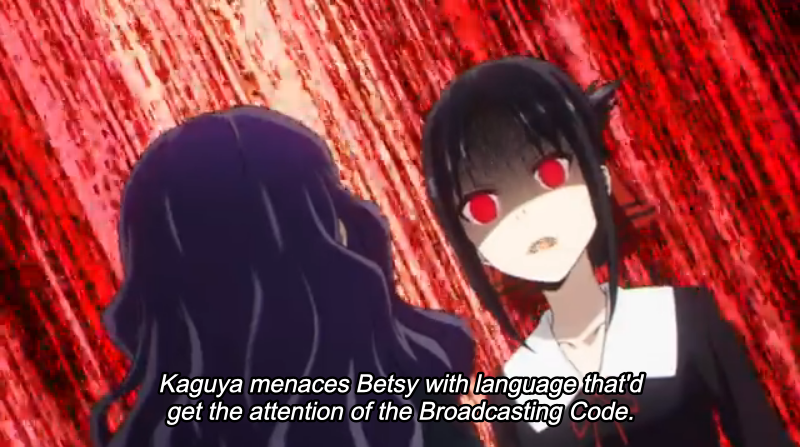 This question reminded me of Kaguya-sama episode 4.